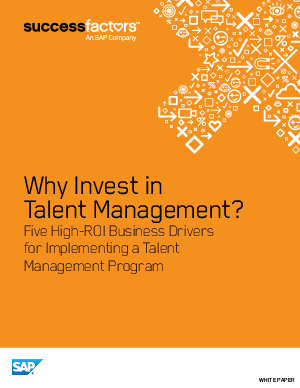 Offers > Success Factors > Why Invest in Talent Management? Do you Have the Right Talent in your Organization? According to a recent Harvard Business Review article, “the blunt answer for many of America’s largest enterprises is: Not yet.” In fact, even with so many workers looking for jobs, companies still have a problem finding the right talent. As examples, the article mentions hospital executives fretting about internal talent pipelines that keep producing the wrong kinds of leaders, retailers fuming about promotion paths clogged with lackluster managers who can’t be moved, and all sorts of organizations expressing concern about how well their companies’ executives can pick rising stars who really do have what it takes to lead the company.